Holy Light tittle-magic break/arcane spore actives, don\'t forget bird of prey passive since he has very nice ss. Lol I would keep zoph and thor as tanks (fighter best with double tank) and then ares avatar probably, if you like laocoon more then ares then keep laocoon. Np , I have 90 thor shards at the moment. I think brothers love says it all. Gonna try loki+thor+laocoon (im knight). Will comment you my opinion(of those heroes setup);after ill get loki and thor if you want. I\'m going to inherit Zoph to Thor and then Hermes to Zoph. ;Seems a bit much but I like having 2 alts for different situations. ;Also not a waste of orbs since my Zoph is way better setup than hermes. Personally I am not really impressed with this guys skill. I could see Thor being good in a tripple tank build. 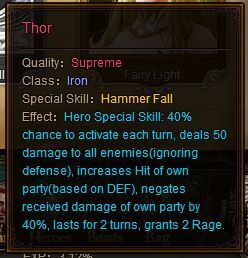 You\'re not impressed with his ss because you look at Thor as an hard casher. Look at this hero from other (non vips/low vips) side and youll like him in whatever build he will be with. mrhappy, why titan seal on thor skills and not magic break ? Just don\'t attempt to build him as a nuker (i.e Avatar title or similar) since his SS damage greatly depends on PDEF & MDEF. 2019-4-21 23:02 GMT+8 , Processed in 0.075750 second(s), 52 queries .